Ibrahim Kachelo’s run-in with the most powerful development authority in Pakistan happened in early October. 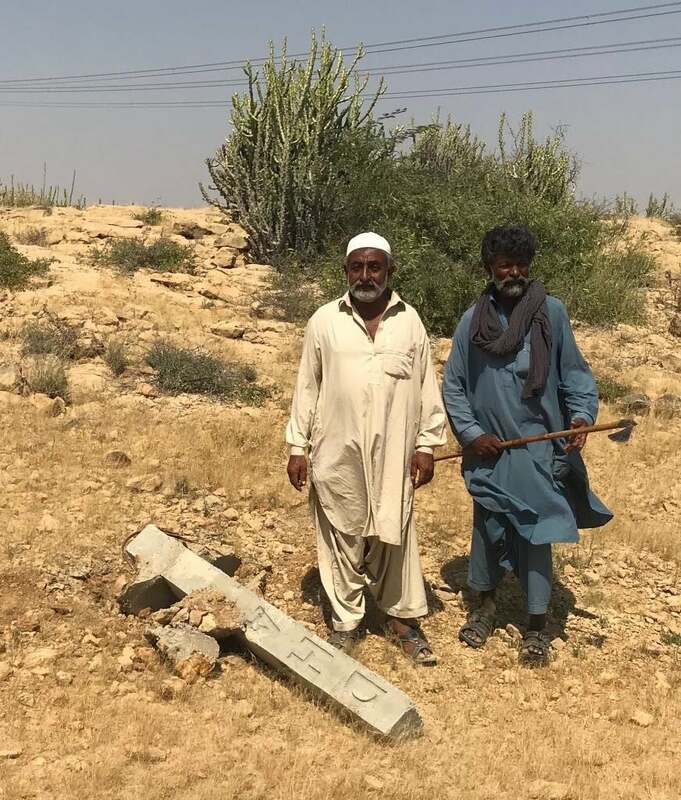 “I was returning from a check-up when I saw a group of people, accompanied by armed guards, putting up concrete DHA markers on and around my land,” says the farmer, his weather-beaten face flushed with indignation. “I told them to leave, that I have a lease for it but they wouldn’t listen.” Furious, Mr Kachelo knocked down the markers in the DHA officials’ presence, the guards drew their guns and a brawl ensued. The men retreated, but Mr Kachelo fears that was not the last he has seen of them. His reaction stemmed not only from anger, but fear — fear that he will be driven from the land that has been in his family for generations. After all, he has seen it happen to others not too far from where his orchard is located along the northbound track of Superhighway in Malir, the largest of Karachi’s six districts. On the opposite side, along the highway’s southbound track, the DHA City Karachi (DCK) housing project is under construction on 11,640 acres in deh Abdar and deh Khadeji (a deh is the smallest revenue unit for land in Sindh, similar to ‘mauza’ in the rest of the country). 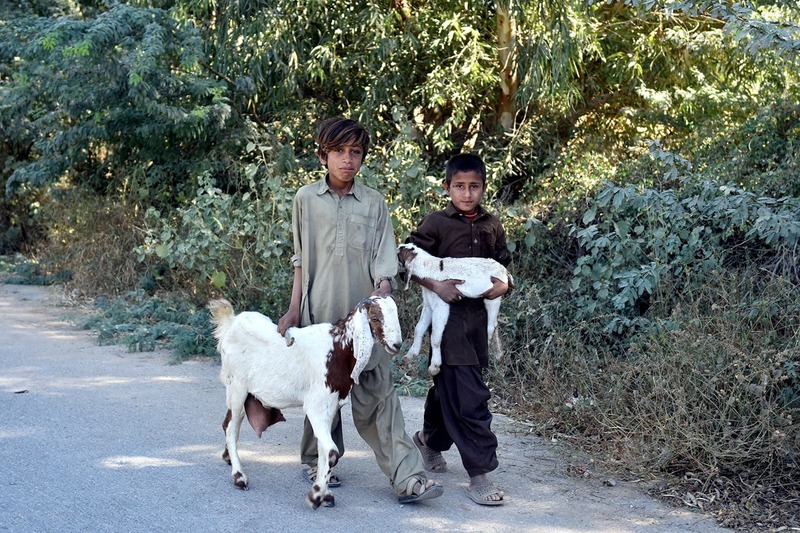 Metalled roads and farmhouses have erased the pastureland where livestock belonging to the villagers used to graze, and the villages themselves have either been walled off or are in the process of being so as construction of the housing community proceeds. 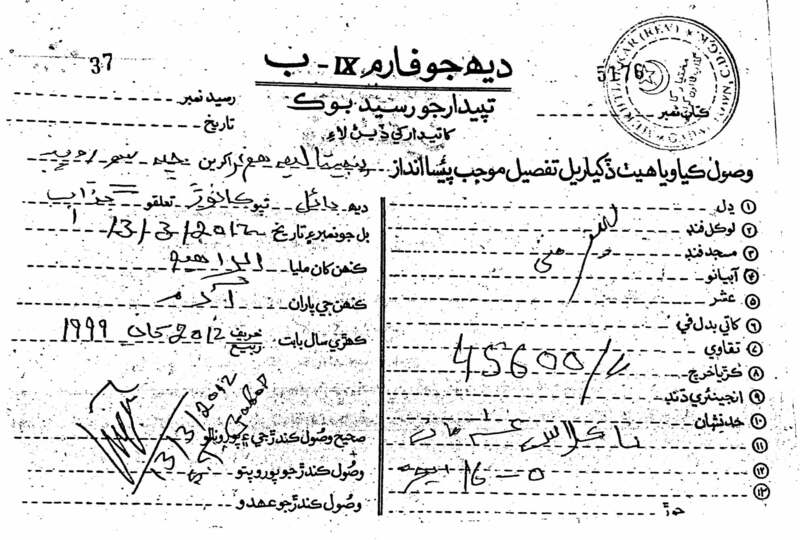 (See box below) That they were able to retrieve some of their land from DHA is only because they filed a petition in the Sindh High Court and it ruled in their favour. These 11,640 acres, which comprise Sectors 1 - 16 of the housing project, were allotted to DHA in 2005 at a concessional rate of Rs100,000 per acre by the Board of Revenue, Sindh. 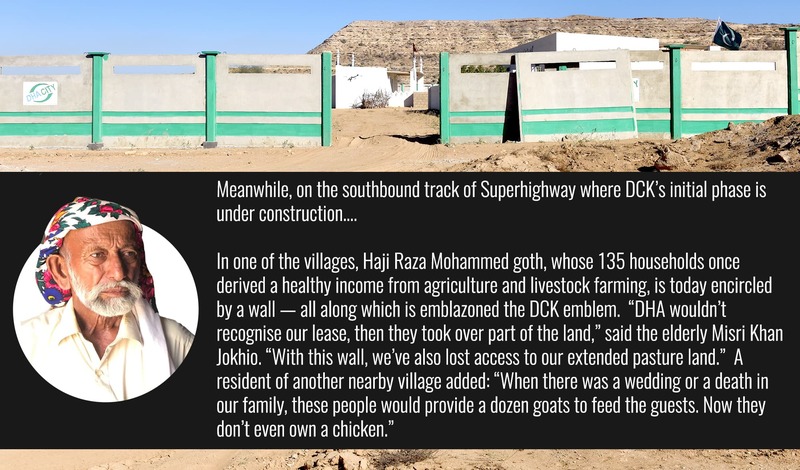 The ‘visit’ by the officials of the Defence Housing Authority, Karachi to Mr Kachelo’s land was in connection with the expansion of DCK along the highway’s northbound track, specifically over 8,000 acres in dehs Kathore and Boil. Mr Kachelo’s land in deh Boil has been in his family since generations; he himself has been cultivating it for 40 years. A rocky outcrop affords a bird’s eye view of the huge orchard, dense with guava trees. “Over the years, I’ve spent millions of rupees on it, including the expense of a tube well. This is my life’s work,” he says. There are many others like him in the surrounding area, where lush pumpkin fields are interspersed with rows upon rows of trellises abounding in bitter gourd ivy. Orchards of guava, chiku and shareefa dot the landscape. Their immediate concern is DCK’s planned expansion. Taj bibi, picking ripened pumpkins along with other women, frets about how the 50 or so members of the extended family that live on the proceeds of their farm will survive if they are forced to leave. 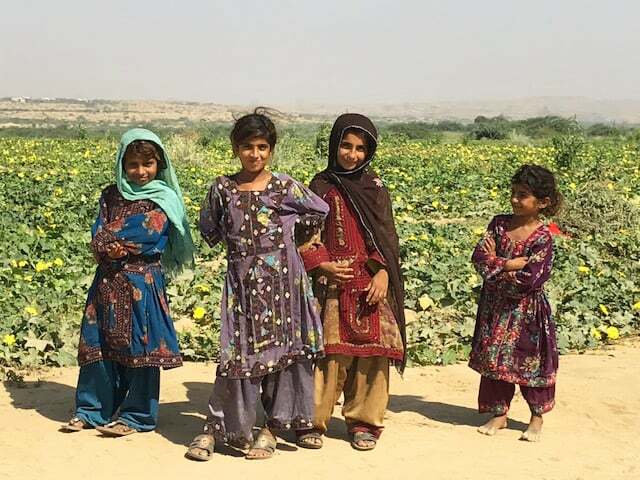 A group of little girls — the youngest of whom is named Benazir — giggle shyly as they pose for pictures, blissfully unaware of the cares that have robbed the adults of their sleep. In 2012, BoR Sindh cancelled all 30-year agricultural leases on the 8,000 acres in dehs Kathore and Boil and allotted the land to DHA, a development the villagers only became aware of a year later. However, aside from a brief foray by DHA personnel into deh Boil around that time — which ended abruptly when the locals sent them packing — the villagers had no reason to believe that their lives were about to be upended. In early 2017, officials from DCK across the highway began to pay regular visits, pressing them to give up their land, carrying out surveys of the area and marking the boundaries of the housing project. Although the government is entitled to cancel 30-year agricultural leases of the kind possessed by these farmers, it is not an absolute right; it is a qualified one. According to Section 24 of the Colonisation of Government Lands Act 1912, if the land authority believes that a tenant has committed a breach of the conditions of his tenancy, he must be given the opportunity to defend himself. Also, according to this law, no penalty can be imposed on the tenant nor his lease cancelled unless he is given a written notice to rectify the breach within a reasonable time, which should be no less than one month. Such protection of an individual’s right to property is in consonance with principles of universal common law. Farmers in dehs Kathore and Boil were renewing their leases regularly, paying their dues and cultivating crops as per the conditions of their lease. A number of them have filed joint petitions against the cancellation of their leases, naming officials in the Sindh government and DHA, Karachi as respondents. It is no less than a David and Goliath struggle playing out in the backyard of Pakistan’s largest city. Officers at DHA, Karachi contend that as it is the Sindh government that has allotted them the land for DCK, it absolves them of responsibility for the farmers’ plight. “They have given it to us according to their due process, and they dealt with the leases on it, and we checked it according to our procedures,” said Administrator DHA, Karachi Brigadier Shahid Hassan Ali in an interview with Dawn. 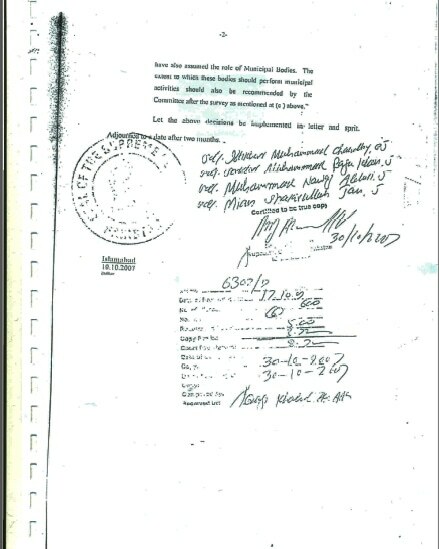 It was on May 6, 2011, when a letter — DHA/TP&BC/ 108/ DCK — from then DHA Administrator Brigadier Aamer Raza Qureshi to the then Sindh chief minister Qaim Ali Shah set in motion events that were to have far-reaching repercussions on the lives of the people in these parts of Malir. The letter, which is in Dawn’s possession, thanks the Sindh government for allotting the first chunk of 11,640 acres at a concessional rate. It goes on to state that, “However, the land that DHA had earlier acquired from the Govt of Sindh is insufficient to meet this demand. The requirement of additional land has become imperative in view of the increasing number of casualties of the armed forces personnel in the War against Terror. It then goes on to request the provincial government to lease an additional 5,000 to 7,000 acres on the same terms and conditions and at the same concessional rate of Rs100,000 per acre as the earlier allotment. As per market rates, land on both sides of the Superhighway was worth at least Rs10 million per acre in 2011. 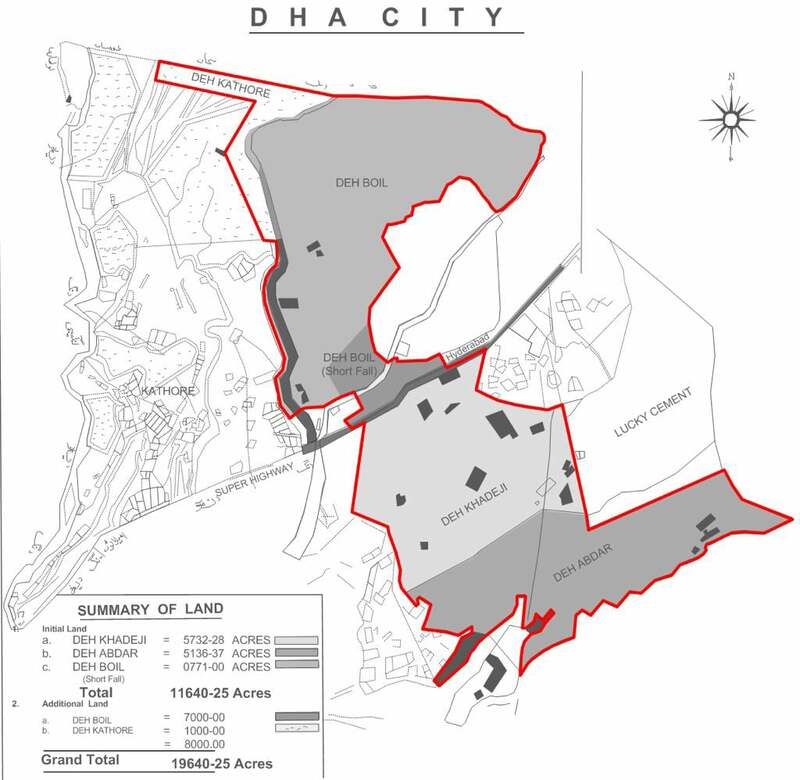 By July 9, 2011, as noted in a document signed by the City District Government of Karachi’s district officer (revenue), the tapedar (land record officer) of the area concerned had reported that a 7,000-acre chunk of land in deh Boil was available for allotment to DHA. 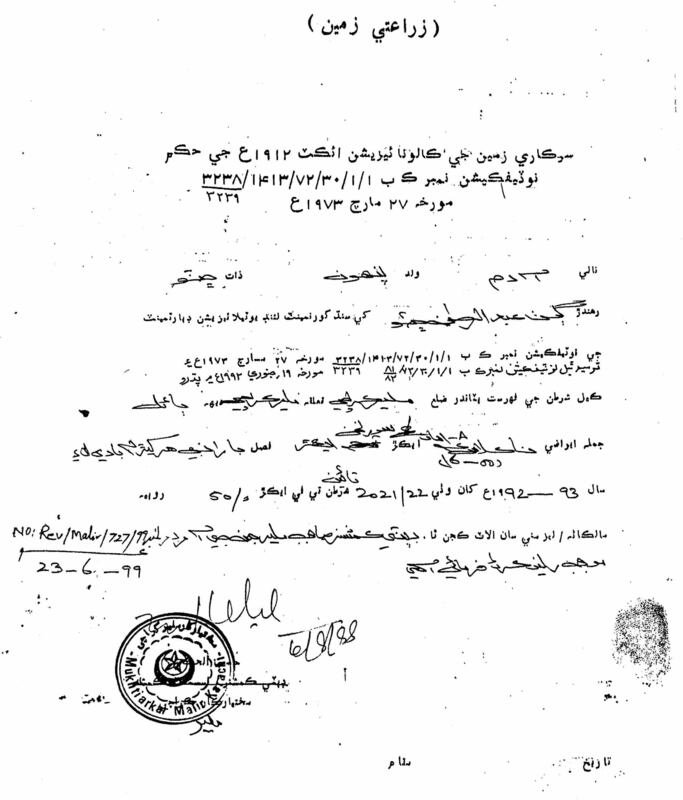 According to this document, the tapedar reported that 30-year leases had been given to 179 locals on 1,481 acres of this area for the purposes of poultry farming and wahi chahi (land partly irrigated from a well) and barani cultivation. Only a “few” people, it said, “have developed/utilised the land for the purpose…Hence, except few matured cases (sic) the remaining grants are liable for cancellation proceedings as per conditions of grant”. The tapedar concerned, as per the document, also specified two chunks of land adding up to 1,000 acres in deh Kathore as being available for allotment to DHA. “Some 30 years undeveloped grants are also falling in the above area”, he claimed. In a letter dated Jan 7, 2012, the Sindh government noted that 8,000 acres had been allotted on payment by DHA of Rs800 million at Rs100,000 per acre and that all 30-year leases on that land had been cancelled. To gauge the jaw-dropping ‘rebate’ given by the Sindh government to a profit-making venture, consider the following. Even according to the official rates, the 11,640 acres in dehs Abdar and Khadeji — which comprise the initial phase of DCK — are worth an average of Rs1.2m per acre. That adds up to Rs14 billion. In the next phase, which involves dehs Boil and Kathore, the 7,000 acres in Boil are worth a total of 7.7bn while the 1,000 acres in Kathore add up to Rs4bn. Based on the official rates (a fraction of actual market value), the price of the entire 19,640 acres is Rs25.7bn. The Sindh government sold it to DHA, Karachi for only Rs1.96bn. If the market rate is applied, the land is worth an eye-watering Rs196bn. Moreover, the allotment of the 7,000 acres in Boil, plus 1,000 acres in Kathore — a thousand acres in excess of what was demanded by DHA — offers evidence, yet again, of how the bosses of the Sindh government sacrifice the rights of the people to profit from favours to powerful segments of society. The provincial political heavyweights’ alacrity in matters like these is in stark contrast to its sluggish or non-existent response where the people’s basic needs are concerned. For instance, there is no higher secondary school for girls within reasonable distance, which discourages parents from educating their daughters beyond Grade 8. Their repeated applications during last several years to the education department and to the local PPP MPA Sajid Jokhio have fallen on deaf ears. The locals’ appeals to authorities about the imminent loss of their land have been similarly ignored. 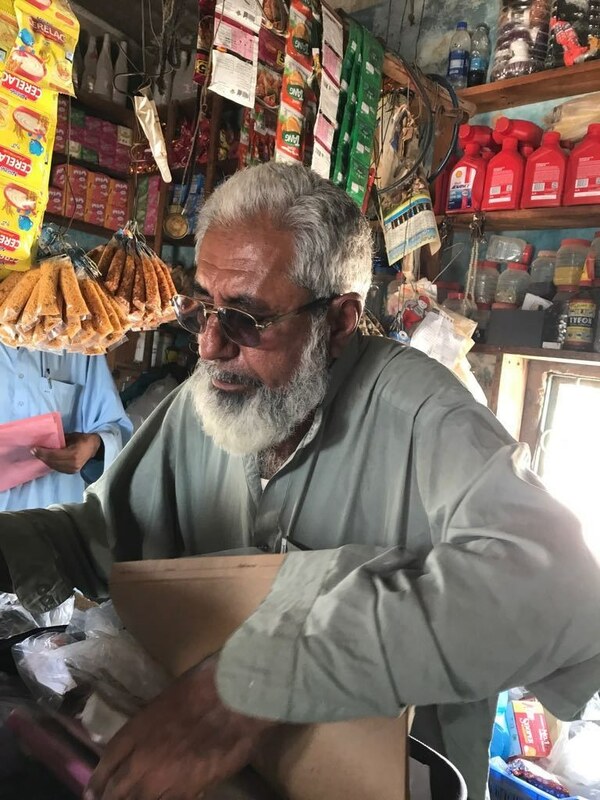 In a small provisions store in deh Boil, amidst the shelves of juice boxes, packets of crisps and other assorted items, local councillor Karim Bakhsh Chutta opened a small, battered case. It contained documentation of the residents’ struggle against DHA Karachi on the one hand and Bahria Town Karachi (BTK) on the other, two behemoths squeezing them from both sides in a pincer movement. There are letters to the Sindh chief minister, Rangers, police, etc asking for their help in preventing the takeover of their thriving farmland. All have gone unanswered. 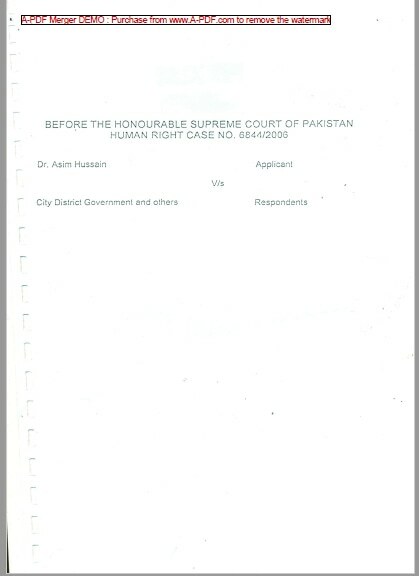 Having run out of options, residents of Abdul Rehman Chhutto goth in deh Boil have filed a constitutional petition No. 6504/2017 against the Sindh government and DHA Karachi. In it, they denied that their leased agricultural lands — which add up to 229 acres, aside from the 18 acres on which stands goth Abdul Rehman which was regularised under the Gothabad Scheme Act, 1987 — had not, as claimed by the provincial government, lain undeveloped in violation of the lease terms. As the matter stands at present, the Sindh government and DHA, Karachi have been issued notices to respond. District Malir, measuring 521,000 acres, lies in the north and east of Karachi. Its 43 dehs comprise the rural outskirts of Karachi. Many of these dehs, such as Langheji, Kathore and Boil were part of the city’s periphery that supplies fruit and vegetables to Karachi. This green belt is all the more precious because of the unplanned construction that is obliterating green spaces in the city’s urban areas. 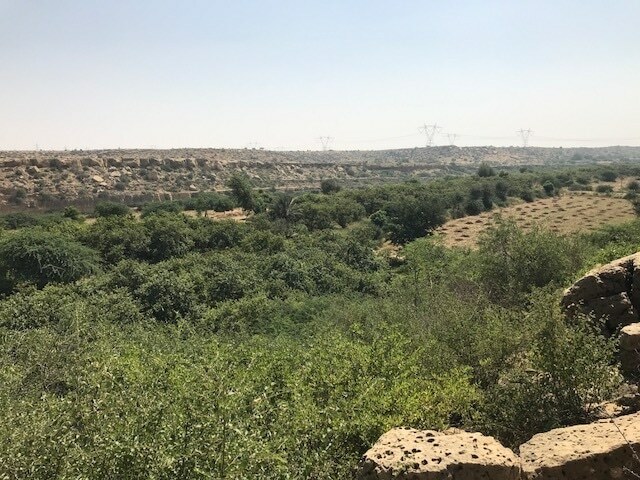 When it rains in the Kirthar range, the water rolls down to the plains of Malir to replenish the aquifers and check dams and bring seasonal streams to life. The land here is either rain-fed (barani) — with agriculture being dependent on the rains — or it is sustained all year round by groundwater drawn through tube wells. Notwithstanding its close proximity to a large urban centre, an oppressive feudal system prevails here. Sardar Malik Asad Sikander, a PPP MNA from Jamshoro, is the most powerful feudal in the area, which is colloquially known as Kohistan (comprising Jamshoro and Hyderabad districts, as well as parts of Karachi’s districts Malir and West). Mr Sikander regularly plays host to Arab royalty and assorted members of the Pakistani establishment and social elite on hunting expeditions in these parts of Malir district. The expansion of DCK and nearby BTK is inversely proportional to the diminishing of his power and influence. Nevertheless, however well-connected he is, Mr Sikander has to tread carefully given DHA’s enormous clout and the business connections of Bahria Town CEO Malik Riaz with VVIPs in Sindh. At the same time, everything is negotiable for a price, which in his case is reportedly scores of ‘files’ to the thousands of plots being carved out in the housing projects, not to mention other political advantages. DHA Karachi requested the land for DCK — 11,640 acres first and 8,000 acres later — for the purpose of rehabilitating the families of the soldiers martyred in the ‘war on terror’. According to military sources, an estimated 6,000 personnel have been martyred in the war against terrorism since 2001. According to Administrator DHA Brig Ali, the fallen soldiers are compensated according to their rank, albeit there can be exceptions to this rule. “The plots range between five marlas (100 square yards) to an acre (4,840 square yards),” he said. That raises the logical question: why then the requirement for so much land in the name of the martyred? “The families could have been given plots in a city closer to their homes,” says a disgruntled former local government official. The provision of housing is universally considered the basic responsibility of a state towards its citizens. Housing should be planned and developed for living in, not for speculation. Exploitation of land for commercial reasons results in artificial price increase and ultimately puts housing out of the reach of the common man. “These so-called housing schemes are siphoning away every last paisa that could help develop low to medium housing in Karachi,” claims a former director KDA. At 19,640 acres (11,640 plus 8,000 on both sides of the Superhighway), DCK is not only more than twice the size of DHA’s first eight phases in the city, which add up to 8,852 acres, it is also larger than Karachi’s Central District (19,000 acres), as well as Lahore’s Old City area (16,000 acres). According to experts, development of schemes like DCK in the green belts and protected areas of Karachi by powerful developers violates all rationales, including rights to property, environmental laws and principles of urban planning. “In any city outside South Asia, they wouldn’t have gotten permission. They would have been told to finish developing [the existing phases] first,” said urban planner Arif Hasan. Even 37 years after the inception of DHA Karachi, an area in excess of 3,000 acres in DHA phases VIII, & VII-extension is still lying vacant, for which, incidentally, DHA has also collected development charges four times. According to a former land official: “It is incomprehensible that a developer whose capacity utilisation has been so poor during four decades has been allowed to undertake another scheme two and a half times in size”. 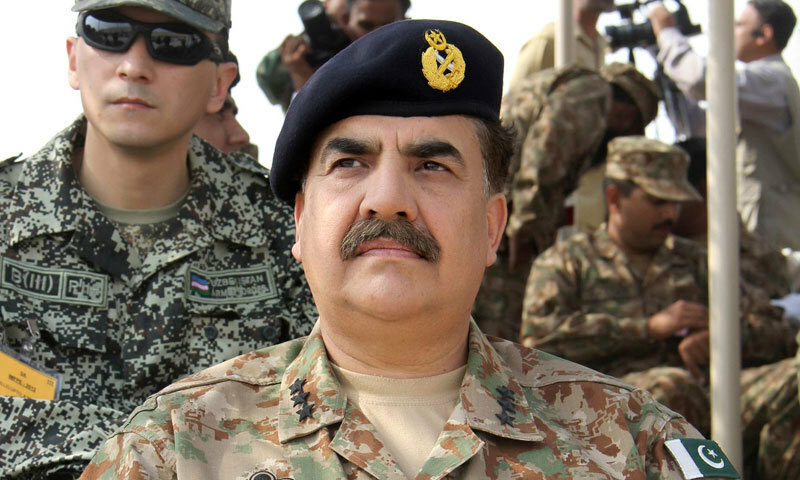 “Speculation is not in our control,” said Brig Ali. “The private investor comes in, and instead of living on it, sells it on. These are market forces about which we can do nothing.” He admits however, that it will be decades before the project is populated. Planned as a “green and smart” city, the housing project is equipped with a 1.1 megawatt solar project. In response to a question about supply of water and other utilities, the administrator replied that DHA had approached the Sindh government for a reasonable allocation from K-4. K-4 is the water supply scheme that the Karachi Water and Sewerage Board has been pushing for almost 20 years to overcome the shortage of water, then assessed at 650 million gallons per day, faced by Karachiites. In 2003, the Indus River System Authority agreed, though in principle only, to allocate 260 MGD additional water. The feasibility study and designing of the project has been done by Osmani & Company Ltd. Estimated to exceed Rs 25 billion, K-4 was awarded to the Frontier Works Organisation for construction without the mandatory requirement of a public tender. Interestingly, OCL along with the Greek company Doxiadis Associates are also the lead designers/consultants for DCK. According to a former MD KWSB, the design team was told to route K-4 along DCK and through BTK. Such routing has created a problem for KWSB as there is no fiscal allocation for the construction of the requisite connections to supply even the remaining water to Karachi. It is also worth pointing out that unlike all other water flowing through gravity into Karachi from the Indus, this route involves massive pumping against gravity. Early in March this year, a NAB case against revenue officers of District Jamshoro, Taluka Thano Bula Khan was reported in the press. ADC-1 Javed Soomro and AC Irshad Kamlani sought bail before arrest in a case pertaining to the sale/transfer of 731 acres of government land — shown as private land in the record of rights — to DHA Karachi. It seems that someone in BoR, realising there was no qabooli (inherited/privately owned) land on either side of the Superhighway, and that a fraudulent transaction had taken place, reported the matter. Locals allege that Malik Asad Sikander, well known for maintaining links with both the security establishment and VVIPs in the Sindh government, had arranged the fraudulent sale and transfer of the land in Jamshoro district to DHA, Karachi for DCK’s Sector 17 in order to circumvent the Supreme Court ban on allotment and lease of government land to private and public entities that has been in effect since November 2012. NAB documentation of the case (ID no: NABK2015111019865) lists nine persons under investigation, including three government servants and five private individuals. The amount involved is listed as “more than Rs500 million”. The findings also record that “DHA has not responded to a single query despite issuance of call up notice”. The sensitive issue of jurisdiction in DCK is also far from clear. All land development must be overseen by a municipal authority, where its by-laws apply. Phases I till VIII of DHA Karachi are contiguous, and fall under the municipal jurisdiction of the Clifton Cantonment Board (CCB). However, DCK, sometimes also called DHA Phase-IX, lies some 40 kilometres beyond the limits of the CCB as the crow flies, and falls in the municipal jurisdiction of Malir Development Authority. Map of DHA City given by DHA Karachi to the Malir Development Authority. The administrator DHA, Karachi, conceded that there is a “procedural anomaly” in this respect, adding: “We have started the process with the Sindh government so that DHA, Karachi would provide the municipal services to DCK.” There were, in his view, several options that could be considered. Sources said one of those options, a strong possibility, is for DCK to be notified as a ‘detached’ part of CCB in order to bring it under its municipal control. However, the definition of cantonments in Section II of the Cantonment Act 1924 does not provide the necessary cover. Moreover, such a move would violate an apex court judgement. In October 2007, the Supreme Court, in a human rights case (6844/2006) ordered that “Civilian areas shall be excluded from the cantonment boards through a notification by Ministry of Defence. To identify such areas, a survey will be conducted by a committee comprising Director, Military Lands and Cantonments Karachi, EDO Revenue.... The committee shall submit its report within one month”. However, the review petition was “dismissed for non-prosecution”, and the SC’s order has not been complied with. Although it led nowhere, the work by the committee — which also included the director, military lands and cantonments Karachi — is illuminating. To give but one instance, while the Clifton Cantonment’s civilian area came to 9,953 acres, its area of operational (military) use is only 58 acres. In fact, the operational areas in all of Karachi’s six cantonments add up to 17,516 acres, about 2,000 acres less than all of DCK, of which no part is designated for military use. Meanwhile, the civilian areas in the six cantonments add up to 26,095 acres, some 6,000 acres more than the land thus far allotted to DCK. 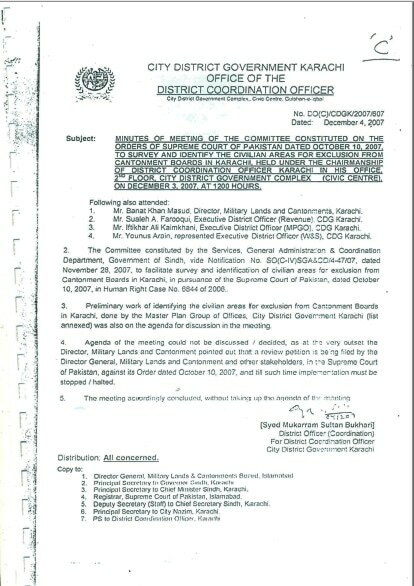 Even earlier, a report by the National Reconstruction Bureau during Gen Musharraf’s government had also recommended that non-military use lands in Karachi be excluded from cantonments and handed over to CDGK. However the recommendation was not acceded to. According to sources in MDA, which has a claim of more than Rs1.35 billion as development charges alone against DCK’s Sectors 1-16, DHA Karachi has neither submitted layout plans for the scheme, nor obtained the mandatory Permission to Build or the NoC to Sell from the Authority. MDA authorities insist they have sent several letters to DHA Karachi, but that the latter has not responded. According to news reports, on Oct 7, 2017, the Sindh government has transferred an additional 8,500 acres of land to the army in district Jamshoro for the families of the martyred at the rate of Rs15,000 per acre. Meanwhile, the DHA City juggernaut continues to roll on in the name of development. Good to see DAWN highlight issues of the common man whos voice would have gone unheard otherwise. They still vote en masse for PPP. DHA schemes throughout the country need the deepest possible scrutiny and audit. Similarly all other housing schemes mushrooming in the country need to have stringent oversight. The whole Paksitan is with Ibrahim Kachelo. I am glad someone has taken the stand against these hooligans or Land Mafia. Mark my words, NOTHING WILL HAPPEN !!! 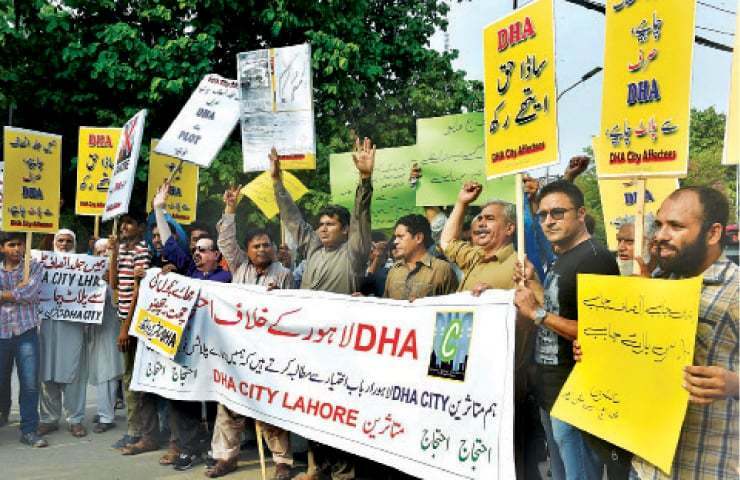 Great effort at highlighting the issues caused by DHA. Please also explore the issue of DHA Peshawar, it is taking away the only agricultural land left in Peshawar valley. I salute Dawn for publishing against highest authorities and important topics which no one seems to talk about. A very brave account of irregularities in the whole scheme of DHA including environmental impacts and issues of importance. Excellent example of investigative journalism! Kudos! Law of powerful- by the powerful- for the powerful. Although the writer has made a couple of pretty valid points in this screed however what I fail to understand is the market valuation of Rs196bn that the writer suggests. Being a resident of Karachi who is aware of the property market, I am pretty sure that this valuation is the valuation after the emergence of societies like DCK and bahria in this locality. However, any clarifications by Dawn or its correspondent on this valuation number would be highly appreciated. In addition to the 11,640 acres of land purchased by the DHA in 2005 during the presidency of General Pervaiz Musharraf, the PPP under the presidency of Mr. Asif Zardari also allotted 7,000 acres of land to the DHA at Rs.Two lakhs per acre plus 1,000 acres free from any costs (this was given free for allotment as per newspaper reports to martyrs families). This has been in the knowledge of all concerned but is there anything one can do about it? As for Bahria Town, that is one sad story about the capture of land by the corrupt who rule this land. They are the untouchables who can buy anyone anywhere anytime. After the story on BTK, yet another Eye-Opening Investigative report from DAWN shows how Influential builders/forces are taking away public resources and getting the hold on common's man's land by hook or by crook, and how incompetent Sindh Govt is facilitating them. Fantastic piece of investigative journalism. It is time that we also punish these white collar criminals. In a innocent way serving the cause of great importance of public as well country's interest, but for whom ? There are significant demerits in expanding cities horizontally but we keep doing so. Thousands of acres of land have been converted into housing socities in past couple of decades with no consideration to its impact on environment. Our greed for property is neverending phenomenon; nobody is doing anything related to conservation of precious natural resources like water and forests. We are of course a rudderless nation ! DHA is the most corrupt institution (whether it be civil or military) dealing in the lands. Despite orders from SHC, they continue to grab lands from others and not developing the land they have already gulped. Current areas of DHA from phase 1-8 shows that its not an elite residential area now, due to no maintenance and development. No water is being supplied and the sewerage and road network is in demolishing state. 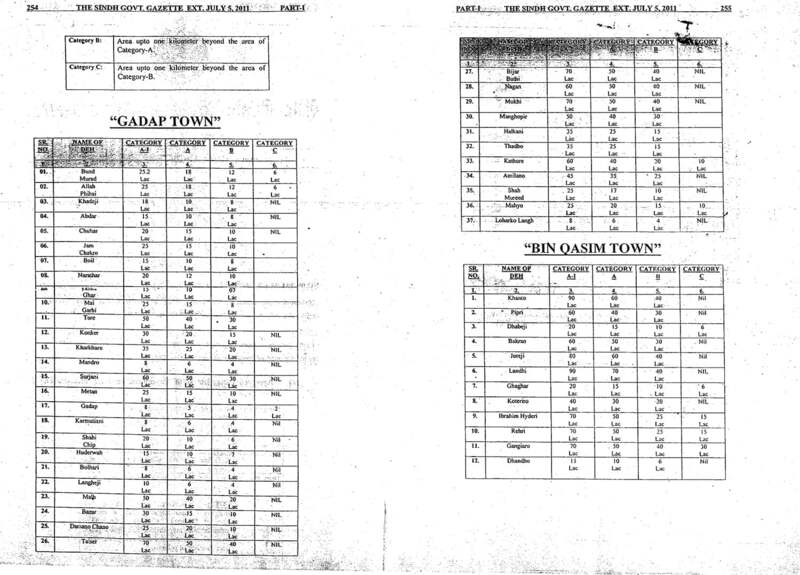 The scams at DHA multan and Bahawalpur is also evident to all as to how the draw/ balloting result was delayed. Shouldn't this article published in URDU as well! This is what happen when most powerful institution will be doing business. Comprehensive article, everything is for sale in Sindh, when the people of Sindh would understand that the officials and the people they voted are their enemies. Hope people will realize that they are cheated in the name of Bhutto. This PPP has nothing to do with him. DHA seems to be following rules, but yes they are exploiting rules to their favor.... they can’t be blamed as each business entity would want to get maximum benefit. It’s the government of Sindh and the revenue board involved in malpractices, unfortunately it’s the poor farmers ending up in misery. They must contact the Mohtasib and courts of law. Excellent investigative reporting. Kudos to the correspondent and the paper for this story. Great job by the Journalists...truely shows Dawn is class apart.. Excellent...Great job these journalists have set the bar high. Also shows that DAWN is a class apart..
We should know that this land was not suitable for agriculture. The farmers can sell their land to DHA and buy agriculture land somewhere else where it is feasible. In Lahore farmers sold their land in kanals and bought land in acres a little far. I know few of them and they are happy. 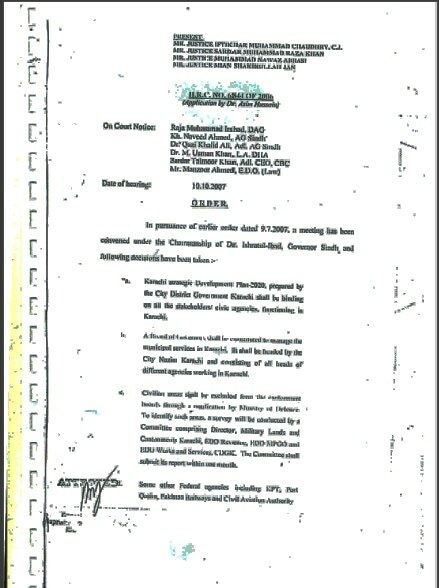 Do not forget Model Colony near karachi airport was also a agriculture land and farmers sold their land. People bought buses and minivans and changed their profession from agriculture. Please look at realities . In the interest of people of Pakistan, Supreme Court of Pakistan should take Suo Moto action. Respect for the author. We need more news items like this dominating our front pages, instead of the game of thrones the politicians play to keep us entertained. Very good reporting. Use of factual sources and analysis is strong and shows what these land development schemes usually are, subsidisation by the state of conniving institutions. I just hope that there is a reasonable sustainability analysis, particularly in relation to water resources. Well done to Dawn team and author - Pakistan needs more such analysis and investigation. I really cant believe that i am reading this,,, i mean who in pakistan can write the truth about these mighty DHA,, i hope the reporters will be safe and will not face any consequences for this excellent work,, we can not go ahead unless we treat all kind of corruption with iron fist.. this is might work and the people on other side are mightier than whole nation. i salute Dawn and reports for doing such a great job. Is Govt of Sindh sleeping.....why did they allocate and offer land to DHA which is a reputable organization despite it has already been allocated earlier? DAWN should also highlight DHA City Lahore project which affected the most middle class. They grab and / or acquire the land at cheap rates and sell to the people at exorbitant prices. The land mafia is the most powerful mafia in this country and unfortunately untouchable as well. Please read the article published in Dawn few years ago by the title Bahria Town Greed Unlimited which tells a similar tale. Only Dawn has the courage to publish such an article. Great reporting by DAWN. Hopefully these people stops voting for the corrupt from now on. 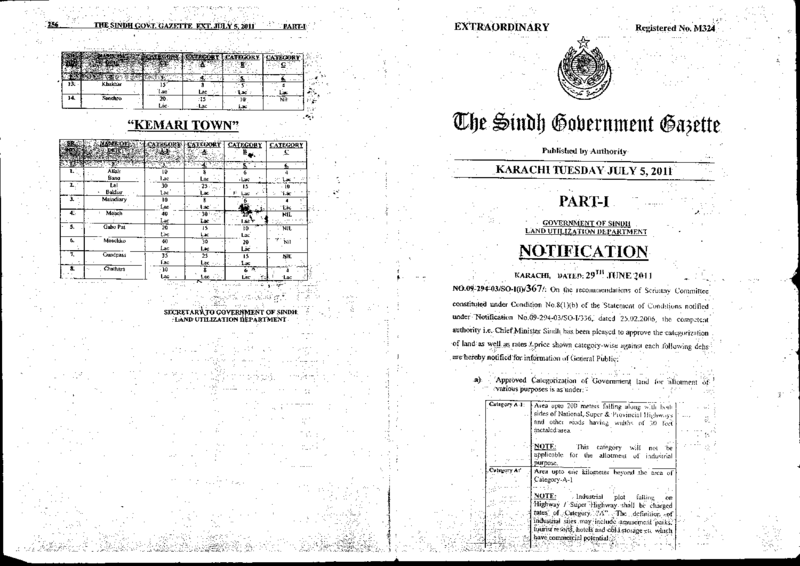 Sindh Govt allotted 44000 acres land to Bahria Town. Dawn story published on 2 July 2015. Only the most leading Newspaper of Pakistan DAWN would have the guts to print an article like this one. My respect to Ibrahim Kachelo for standing firm on his principles for his community living there. @Farhan if this report published in urdu then the reporter and the paper will be in trouble.because powerful never allow the masses to understand the horrendus crime done by them. Kudos to the reporters and the paper. Dawn you have set standard for reporting unlike any in pakistan media. Instead of mirch-mesla you guys done a absolute fantastic job at investigating and collecting evidence and then putting in words that a lay man can understand. Its Monday and I really don't have the time to read this whole article, but from what little I read, the poor people are basically being thrown out of their lands that have owned or leased for decades. I really appreciate DAWN bringing up another issue that shows how these political parties just roll over the poor and reward the rich and the powerful.As a citizen, I really don't care to hear bout the procedures when you are destroying the livelihoods of hard working people who vote for these thugs. This is unacceptable. Excellent reporting exposing the land grabbing mafia. What the martyrs' families deserve is the social security provided by the state ie advance lump sums which the martyrs would have accrued at retirement age followed by pensions at enhanced rates, free education for their children, free medical treatment, employment quotas in the public sector and housing commensurate with the ranks and living standards. Illegal land grabbing to the tune of thousands of acres as mentioned in the report in the name of martyrs must stop and the poor farmers be left alone to lead their lives as normal. One choses military career to earn livelihood and defend the motherland with the clear understanding of the risks associated with the career. The martyers would definitely not have wanted the poor farmers to suffer in their name. Are there any examples in the islamic history of what we are doing in the name of martyrs? Loot bazars and land grabbing in the forms of DHAs and Bahria town must end. I'm deeply saddened to see state of affairs in Sindh. Sindhi citizens must unite against immigrants, military establishment, and local feudalists who dictate foreign culture and occupy their territories. Pilferage and robbery of the land continues as a healthy competettion between Bahria town and defense housing. All in the name of forces and defense of Pakistan. What a tragedy that the only land they can conquer is their own. We need to build new cities. We have three major cities across whole Pakistan i.e Lahore, Karachi, Rawalpindi/Islamabad. All of these cities are intensely populated resulting in creation of massive problems including social/civic problems. I don’t doubt that there are corrupt and oppressive practices involved in how the lands are being allotted to the developers. However, what the article doesn’t even mention is the actual price and terms of lease these farmers have. I wouldn’t doubt if they lease these lands at the rates from 1920s or best case 1980s. It could be pennies on the dollar, perhaps even less than Rs. 1000 a year. Either way, if reporter is going into details about market value of land, not mentioning the lease prices is not fair journalism. Another argument that I would make is that by keeping artificially low lease prices over the years (if that is truly the case), the farmers found no reasons to upgrade their farming methods as they have no serious costs associated with an essentially free lease. While it would be a blessing while it lasted, it’s absolutely a nail in the coffin of the farmers if free market forces are to reign. 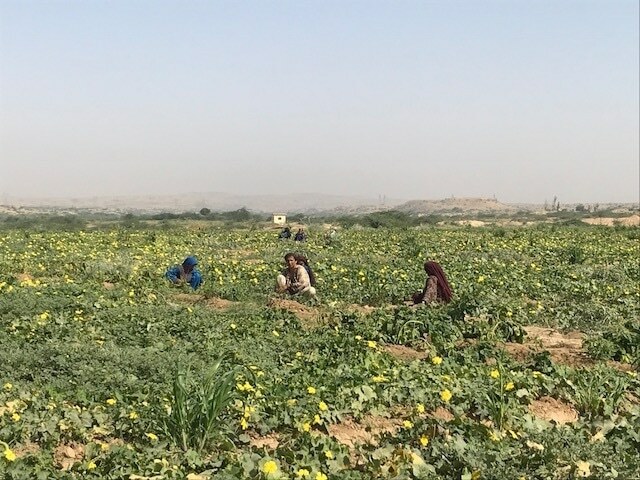 On the side note, women working in the agriculture sector side by side to men (as shown in pic picking vegetables). They dont have a choice but to share equal burden of financial responsibility/physical work with their men due to POVERTY. But when it comes to inheritance, they are told they will get half the share as compare to men because they dont have financial responsibility of the house . What an unfair law towards women. Sadly in past 45 years there was no housing scheme in Karachi after, Federal B Area, North Nazimabad, Gulshan-e-Iqbal and Gulistan-e-Jauhar. All other sub slandered schemes were from private organization. Most of them were fraud and cheaters. 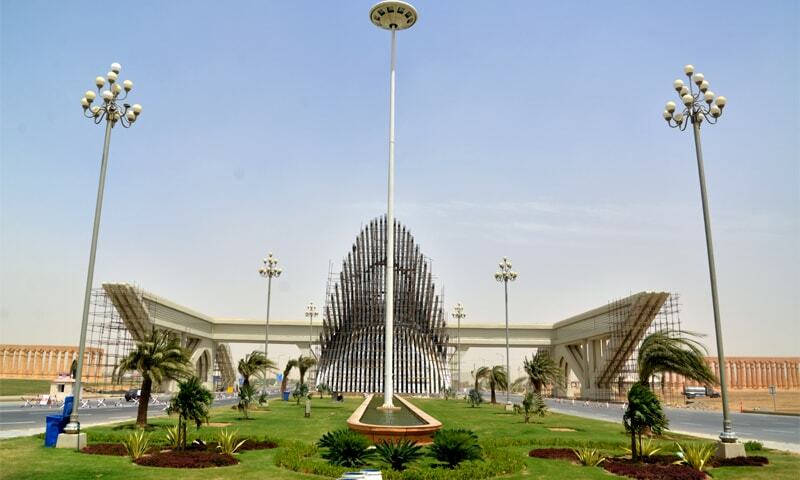 The 2 new scheme organized by DHA and Bahria are standardized and authentic in the sense that their progress is ensured and have some standard. Good reporting. Some one should also publish report on DHA CITY Lahore - a bit scandal of DHA. What about Bahria Town, Karachi? Bahria Town , Karachi has occupied more than 40,000 acres of land illegally. A number of inquires are pending with NAB. They all are mafias . @Faraz Did you not read the story? The Sindh govt is in on the scam. The local politician will get many free or almost free plots. And so will everyone else involved. @Usman786 with your level of intellect you should be a household worker or peon. "Officers at DHA, Karachi contend that as it is the Sindh government that has allotted them the land for DCK, it absolves them of responsibility for the farmers’ plight". What a lame excuse by DHA. If they say this in court, I am 100% sure all DHA officials will get arrested. Shame on Sindh Govt shame on PPP. @Uzair so build new cities by occupying land of poor people? Why not on millions of acres of jageerdars and waderas? Please also write about DHA Rawalpindi (formerly DHA Islamabad) and the scam of DHA Valley in which thousands of middle class people and overseas Pakistanis lost their savings. While growing up I used to visit these small villages and they always facinated me. I am sorry villagers I can't help you in this because this is beyond my strength. I feel sorry for this city, this land that has been destroyed by certain mafias and no one is bothered. I read with great interest and gloom the painful story about destruction of our precious landscapes, biodiversity and prime agricultural lands by powerful land mafias, in one way or another pretext. Its more painful to learn that malnutrition is stalking the life and limb of 50% of our population and 44% of our children are stunted. with these stark figures, and climate change looming large over the horizon, there is little hope for 3/4 of our population ever having the chance to survive in the next few decades let alone prosper or develop. It is shameful how in the name of security or other shady development scheme Pakistan is on the self destruct mode and no one dares to challenge this trend. I hope you can also visit KP sometime, and find for yourself how pristine pastures, forests, agricultural land are being devoured by both official and non official mafias systematically. How PTI has given a clean chit to DHA to gobble up 20,000 acres of agri land in Peshawar's precincts and proposed Bahria town, besides of course, hundreds of other housing schemes that would spell doom to our future. @SK More relevant point is that the land is used to grow food for all of us. And these poor farmers living in the villages there have a decent and dignified life. Paving over agricultural land is a big mistake and expropriating land without any compensation of regard for the people living on it is a crime. we as a nation tend to always look at this negatively, DCK has built state of the art school campus where they are providing quality education to kids from surrounding areas including nearby villages. In some cases kids are actually being paid to study there. DHA City has provided services for the local villagers. I went to see my plot the other day and they had an ambulance with ventilators serving the local villagers, there were kids studying in a very modern school setup. it is easier to criticize one institution... how many options do we have other than Bahria Town which also has no transparency at all and offers only to rich.